The place I've been salivating over ever since The Londoner's post about the American fast food chain. When she wrote it back in 2011 they hadn't opened in London, but… they have now and it couldn't come in better timing as my boyfriend and I were dying for a good burger. 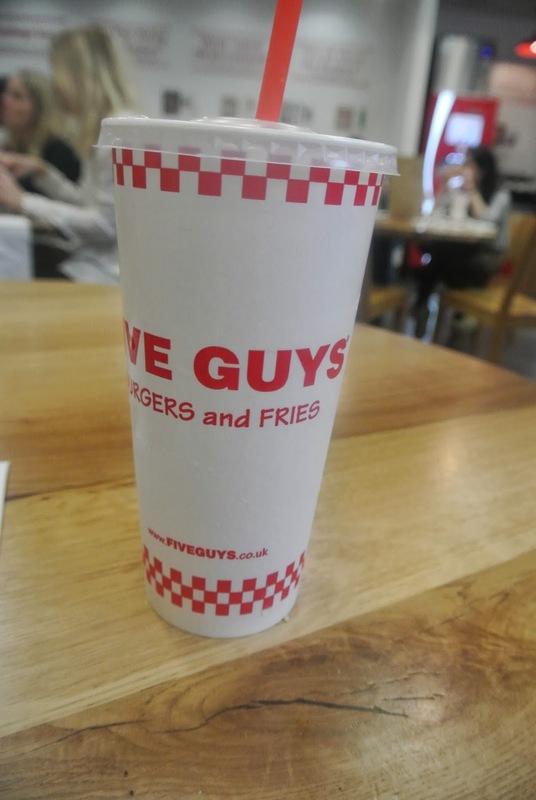 Apparently Five Guys have also been reading Rosie's blog, as she was one of their quotes on their flyers, quite cool if you ask me…do you think she gets free burgers?! There was a queue around the block and they had about 15 people working in the kitchen at once, doing all that fantastic burger-stuff. I'm a simple burger kind of gal (Read: NOT boring) and settled for just double cheese, definitely the best choice. Gustav chose a bunch of different stuff in his and he said he wished he had gotten less, it got too gooey and messy and we're simple people, we don't need eating a burger to be difficult. One thing we both agreed on was that having Bacon in the burger would make it all a bit more great, add a bit of that crunch to the gooey-ness. Oh and free refills too! I'm usually just a Coca Cola kind of person, but this time I went for Peach Fanta - yep it exists, and it was great. Please, please, please tell me you'll go! and Mr. Five Guys? Please, please, please tell me you'll open in Stockholm?! One just opened in angel and I still need to go! I've been to shake shack but five guys is next on my hit list!